Oslo Cathedral (Oslo domkirke) — formerly Our Savior’s Church (Vår Frelsers kirke) — is the main church for the Oslo bishopric of the Church of Norway, as well as the parish church for downtown Oslo. The present building dates from 1694-1697. 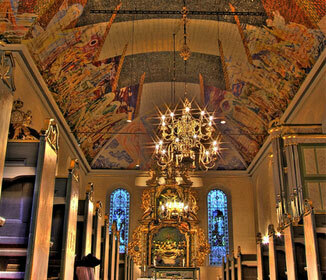 The Norwegian Royal Family and the Norwegian Government use the Cathedral for public events. It was closed for renovation in August 2006 and re-opened with a festive high mass on 18 April 2010. The current Oslo Cathedral is the third cathedral in Oslo, Norway. The first, Hallvards Cathedral, was built by King Sigurd I of Norway in the first half of the 12th century, and was located by the Old Bishop’s Palace in Oslo, some 1.5 kilometers east of today’s Oslo Cathedral. For almost 500 years, Hallvards Cathedral was the most important church in the city. After a great fire in Oslo during 1624, King Christian IV decided to move the city a few kilometers west to be protected by Akershus Fortress. Construction of a new church was started in 1632, on the main square in the new city. After that, Hallvards Cathedral fell into disrepair and decayed. In 1639, the second cathedral was built (Hellig Trefoldighet). This cathedral burnt down only 50 years after it was built, and the current cathedral was built. The church was probably designed by Jørgen Wiggers, the Councillor of the State (etatsråd), . The current cathedral was erected on a small rocky outcrop in the east end of what would later become Stortorget. The foundation stone was laid in 1694 and the church was consecrated in November 1697. 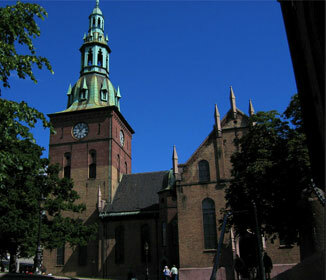 In 2001, Oslo Cathedral was the site of the wedding of Haakon, Crown Prince of Norway, and Mette-Marit Tjessem Høiby.